Welcome to the Neo Trad Condo! Better late than never is the saying, right? This was a super early project for Unpatterned. Like two kids now live here that didn't when I worked on it early. I am so grateful to these clients for putting their faith in me to help them transform their first home. We came back to shoot the project a while after completion and will spare you the details, but some technical difficulties happened. However, these photos just surfaced (you may recognize the two that we did have) so I am sharing a few before & afters and some process here, including the above great room. Below you can see a before of the room above! 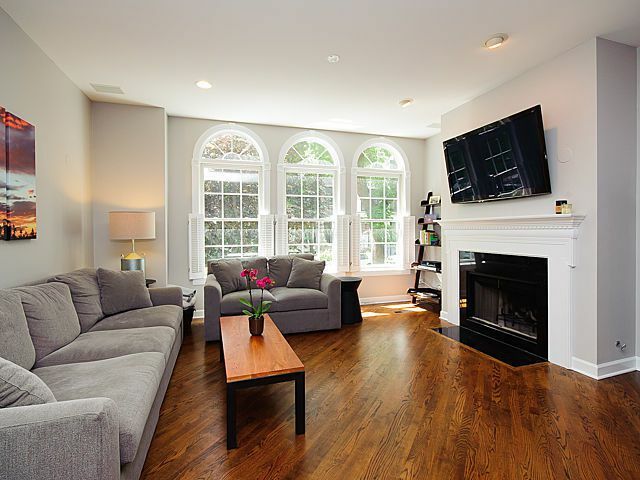 We added this fireplace built-in with cabinetry, shelving and a complete fireplace surround. It really elevated the space from black granite and drywall, plus upped the storage game, always key in city living. The moody blue/gray paint provides some contrast to all the white cabinetry happening on this floor. Here's a little Before & After of the initial rough concept sketch we did for this fireplace millwork and the final product! The kitchen was completely gutted from it's early 2000's brown and orange that we see so much of. We maxed out storage with floor to ceiling cabinets and by turning the island into a peninsula, which helped to incorporate a wine fridge into the cabinetry instead of floating off to the side. Tone on tone backsplash and cabinets kept it classic and bright and clean given the amount of cabinetry in a small space. A Kichler chandelier over the dining table adds some drama and definition to the space. The drawer microwave keeps the counters CLEAN. I love that we were able to add storage, but still keep the space nice and open. The green tiles got the boot and the wood floors were extended into the kitchen to create some continuity and warmth. The hall bath got a total makeover, including the incredible Sabine Hill encaustic cement tiles! This unit is a duplex down and the lower level was turned into a wide open family room. Again a full wall of built-ins was added to anchor the family room. New porcelain tiles replaced the engineered wood. A partial height wall was removed to open things up for a ping pong table (not pictured), just adjacent to a new bar. 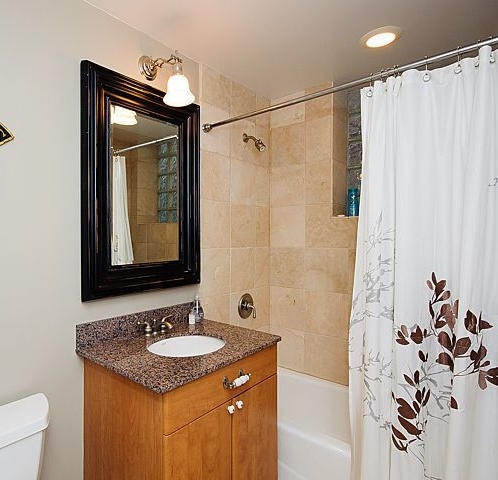 Last, but not least, we can share this side-by-side of the lower level bathroom. The tub was replaced with a walk-in shower, the 12x12 home depot tile replaced for large scale porcelains with a nod to the blue/gray scheme upstairs and the vanity and mirror upgraded to bright and white! We're glad we were able to share this oldie but goodie with you today. You can see all the photos here. To start working on your own before & after, get in touch here! See another open concept first floor gut here. Check out another full condo rehab here. See more fireplace makeovers here and here. Unpatterned Paint Color Quote in House Beautiful!